In my fantasy blog, I am posting photos of my trip to Paris. Unfortunately, the daily dramas just keep coming, and no writing is happening at all. Are you ready for a summary? Leonard the Koi: Negotiations continue, personalities emerge, and Leonard is still in his original home. I am trying to find this 30 year old, 24″ Koi fish the best home possible, so I am working with a local Koi club. This venerable fish is not a fancy variety, and of course there are quarantine requirements, but he will be examined tomorrow, and decisions will be made. I am secretly hoping that the “best home possible” is right here, but we will know soon. The Three French Hens: The owner of these hens is not eager to part with them. At all. The homeowner’s association is equally eager to have her part with them. The bully pen is currently available, but nobody is in a hurry and that’s okay with me. Dobby has been particularly goofy, and the dancing is non-stop! He seems to be full of energy, and yet, he spends a lot of time napping in the kitchen. This is a change from when he was younger and too wary to really relax in the house. At 6-1/2, he doesn’t startle as easily when someone breezes through the kitchen. He’s still a wild animal, though, and on guard when the wind blows and brings the scent of coyotes and deer into the yard. Yes, the bully drakes are fully integrated back into the flock. They are so happy to be together I can hardly remember what it is like when they are all on the attack. You would think that the breeding season is over, but Carmen Miranda, the muscovy hen, is still laying eggs. I lost a sweet hen, Madonna, quite suddenly, after my return from Paris, but Lula, who is on daily metacam, is hanging in there. That leaves me one laying hen, Jello, or is the cat laying the eggs? I always find them in the cat carrier. Kitty Hawk’s friend, Grover, was quiet after my return, and then suddenly started making gurgly sounds. I talked to the vet about him, and developed a strategy for capturing him so the vet could sedate him to do an exam. (He is still skittish, after 2 years, but he has just started to let me pet him.) We’d discuss medication later. I would take the next day to observe him for signs of recovery or, you know, the other direction. Grover must have overheard me, because he made the most remarkable recovery! Seriously, he’s fine, now. I have noticed that Hawk eats ALL OF THE FOOD, so now I play with him while Grover gets his share. Was Grover simply starving? I shudder to think, but really, Hawk just inhales his food, and Grover is such a gentleman, a dainty eater. Bonnie Bunny recovered from her surgery and moved into the kitchen. She’s in her sister Helen’s old spot. She nearly chewed through the gate while I was away, so I’ve fixed that and will reinforce all the sides with an x-pen. She has always been hard-headed and nervous, but boredom and curiosity will prevail and I’m sure she’ll adjust to indoor life. 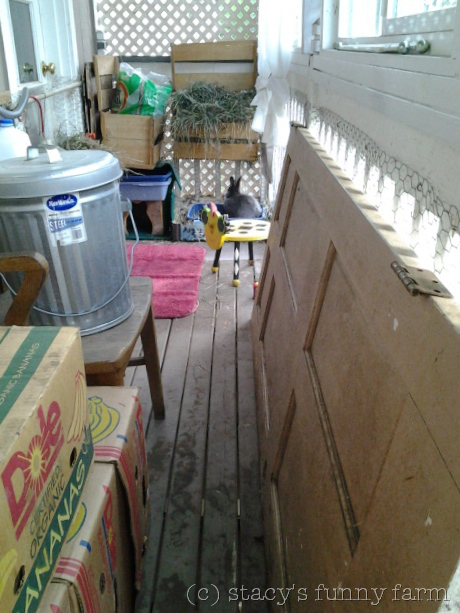 It’s just very different from her gigantic outdoor pen, and I’m sure she still misses Wiley Wabbit as much as I do. The Funny Farm has had a lot of visitors. Dobby and the Dude Ranch steal the show. The guinea pigs will be celebrating Carl’s 8th birthday next month! The cockatiels could star in their own Grumpy Old Men movie, with the tiny green budgie monster providing the sound track. I tried to write this blog post earlier today, but Pirate, the handicapped dove, had to be held JUST SO, nestled between my cupped hands. Try doing anything productive with a bird in your hand and the two in the bush start to sound very appealing! On the human front, we have a full house again, well, almost. It seems fuller when kids come home with all their stuff and an entourage. I’m back at school volunteering again, my fifth year. I don’t want my fabulous trip to Paris to fade away, so I plan to relive every moment by posting photos and writing about it . . . but when? Long before the rambunctious rodent came to live here, a cute little bunny rabbit arrived. Wiley was a well known and well loved feral rabbit drifting through friendly back yards in an upscale urban neighborhood. It soon became clear that he didn’t belong to anyone, and with winter approaching, his protectors grew concerned. A friend of the Funny Farm heard about Wiley, and the next thing you know, he was at the vet being “fixed” and then he was here! 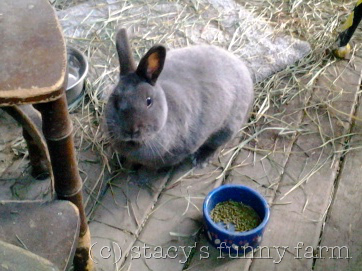 This was a big surprise for both Wiley Wabbit, and little Nosebud, the Rabbit in Residence! She was very excited to share her palace with such a handsome gentleman rabbit. Wiley’s adjustment to captive life was instantaneous. The few times I had him indoors he was curious and inquisitive, not panicked, so I am quite certain he once lived with a family. He was a gentleman and a quick learner. He came to me readily and leaned into me when I picked him up. He was in fabulous condition and was a showoff, too. Wiley took full advantage of vertical elements in the palace. 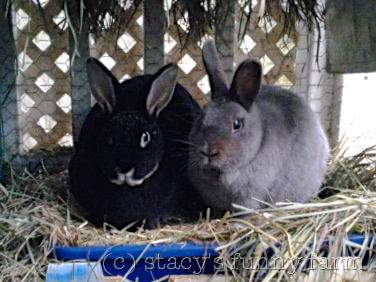 When Wiley Wabbit first arrived, he and Nosebud would hide together under a huge rosemary bush. It died in a hard freeze, so I planted new ones, and used wire to protect the baby plants from chicken scratching and bunny bites. Wiley Wabbit was the Gentleman King of the Funny Farm. Until Prince Dobalob arrived. Dobby got along just fine with Nosebud and Wiley, while he was small enough to enter the palace. The rabbits were happier when Dobby turned into a bull and I stopped allowing him into their china shop. Time passed and Wiley seemed ageless. We didn’t really know how old he was, but only his accumulated wisdom hinted at his years. Eager to join the afternoon garden party with the poultry, he also learned to return promptly to the palace when I went in to refill the dishes. 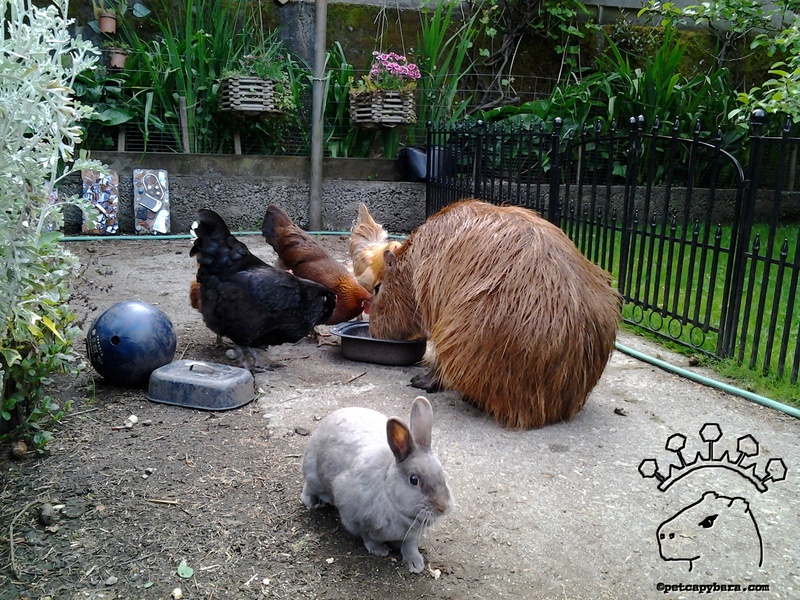 Garden Party time – check out the one-ear salute! Sweet little Nosebud would get confused about returning to their pen, and Wiley would gently get her attention and coax her in. And just two weeks after I took her to the vet, Nosebud was gone. She had E. cuniculi, I treated both rabbits, but she didn’t make it. Wiley Wabbit was devastated. After about a month, he returned to his trickster ways, but it wasn’t the same without Nosebud. Wiley had plenty of friends, if you include birds. In the photo above, he is helping to re-seed Dobby’s mudhole back yard pasture. The chickens, geese, and ducks destroy it seasonally. Wiley had plenty of treats. The apple tree drops enough for everyone to share, and they all love to forage. Wiley’s palace had plenty of hopping space. Two more rabbits came, but one named Bonnie Bunny claimed Mr. Wiley Wabbit for her very own. Wiley taught her to navigate the garden, and how to find her way back to the pen. Bonnie is very bossy independent but was a serviceable companion for Gentleman Wiley. When he had been here 7 years, he developed allergies and had sneezing fits, but the veterinarian recommended a supplement that worked miracles. He loved getting his “cookie” every day. He also developed cataracts and gained some weight. Wiley wasn’t running around like a maniac any more. He had lived here 8 years when he refused his last cookie at the end of the day. Bonnie Bunny was attending him and he was very still. I knew he would be gone when I awoke the next morning and that there was nothing more I could do for him. Bonnie would have to take him the final distance. Cute little Wiley was even in Dobby’s magazine article, a fitting memorial. Wiley was here for so long . . . I keep expecting to see him come around the corner. I swear I heard his ghost up in the palace: there is nothing quite like the hippity hop of a rabbit. They really do make that noise, you know. 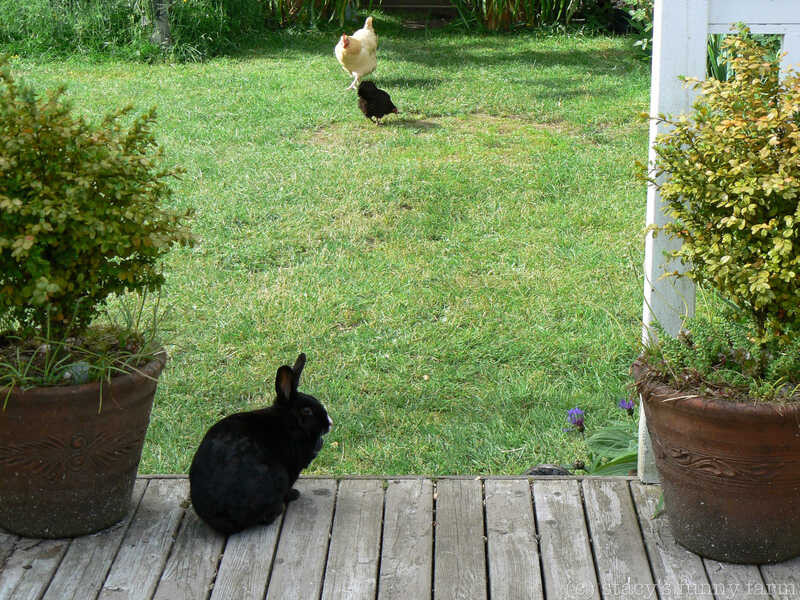 So, I heard a hippity hop across the length of the palace, but turned to see Bonnie just behind me, in the garden. A Wiley Wabbit Ghost haunts the Funny Farm. Perfect.